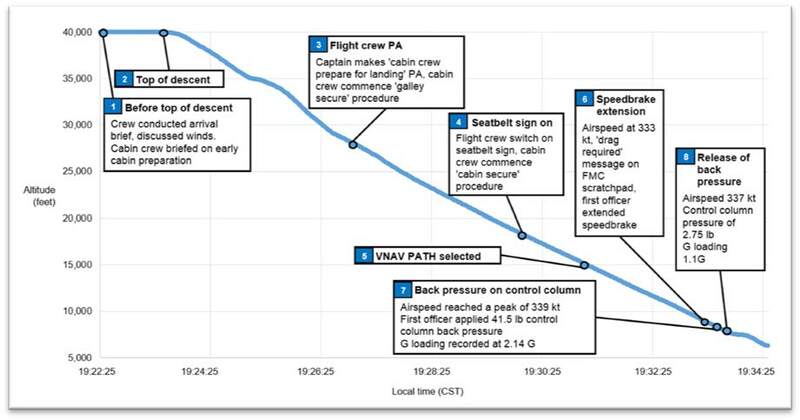 The Australian ATSB have released their final report into Virgin Australia 737-800, VH-YID (38709/3851), in which a member of cabin crew was injured as a result of overcontrolling during an overspeed event in a high speed descent. The F/O was PF and was conducting a high speed descent at 320kts when a change of headwind caused the airspeed to increase towards Vmo. The PF applied speedbrake however the airspeed continued to increase. In an effort to prevent an overspeed, PF overrode the autopilot by pulling back on the control column until the autopilot entered CWS Pitch (the aircraft was pre-FCC P8.0) giving a vertical acceleration of +2.14G. This was followed immediately by an abrupt release of the control column reducing the vertical acceleration to +0.066G. This caused one cabin crew member to sustain a minor injury. On the evening of 9 May 2015, a Boeing B737-8FE aircraft, registered VH-YID and operated by Virgin Australia Airlines Pty. Ltd. (Virgin), was on a scheduled passenger service from Sydney, New South Wales to Adelaide, South Australia. During a high-speed descent, the crew responded to aircraft indications that they were approaching airspeeds greater than desired by extending the speed brakes. While the speed brakes were still extended, the airspeed continued to increase towards the aircraft’s maximum speed, the result of which would have been an overspeed. In an effort to prevent an overspeed, the first officer overrode the autopilot by pulling back on the control column until the autopilot entered a secondary mode known as control wheel steering-pitch mode. This was followed immediately by an abrupt release of the control column, after which one cabin crew member sustained a minor injury. At about 1915 Central Standard Time2, the flight crew conducted an approach briefing in preparation for the descent. The crew discussed the ‘fairly strong’ westerly wind forecast in the area that would affect their descent, and decided they would instruct the cabin crew to prepare the cabin for landing at about flight level (FL) 2703. This was reported slightly earlier than usual and was intended to reduce the risk of turbulence-related injuries. Soon after, air traffic control (ATC) requested the crew to conduct a high-speed descent into Adelaide, which the crew accepted. The FO changed the planned descent speed from 280 kt to 320 kt, which was reported by the crew to be routinely used during ATC-initiated high-speed descents. In an effort to avoid an overspeed, the FO pulled back forcibly on the control column in order to raise the nose, overriding the autopilot and activating the control wheel steering – pitch (CWS-P). This technique was routinely used to manage overspeeds on descent. On this occasion the FO reported feeling greater than usual resistance when raising the nose due to the already low pitch angle. The FO then recalled feeling a ‘pinch’ as the autopilot reverted to CWS-P, along with a sudden pitch change and a high g loading5 on the aircraft. In response, the FO abruptly released the back pressure on the control column, rapidly unloading the g loading. At that moment, the cabin crew had almost completed securing the cabin and were about to take their seats. They reported experiencing what they thought to be turbulence, and two cabin crew in the rear galley lost their footing. This resulted in one of the cabin crew impacting the galley floor heavily, sustaining an injury to their knee. The FO stowed the speed brake, selected the LVL CHG (level change) descent mode and reduced the selected speed to 250 kt. The captain checked the status of the cabin crew and was informed of the injury to the crew member..
• winds from 264 °M at 54 kt at FL 350, from 250 °M at 38 kt at FL 250, from 258°M at 40 kt at FL 150 and from 270° at 41 kt at 5,000ft. • By 10,468 ft in the descent the aircraft reached the selected descent speed of 320 kt. Over the next 30 seconds, as the aircraft descended to 8,136 ft (when the speed brake was extended) the headwind increased from 30 to 39 kt, and the airspeed increased from 320 to 333 kt. • Over the next 5 seconds, as the aircraft descended from 8,136 ft to 7,790 ft, the headwind increased from 39 to 48 kt, and the airspeed increased from 333 to a peak of 339 kt. At this point the back pressure on the FO’s control column was recorded as 41.5 lb, and CWS-P engaged with a peak g loading of 2.14 g.
• One second later the back pressure on the FO’s control column reduced to 2 lb, consistent with a release of the back pressure, with a minimum g loading of 0.066. • The speed brake was stowed about 10 seconds later at 7,492 ft. Between 2012 and 2015, 51 occurrence reports were submitted to the ATSB that involved an overspeed in a B737 aircraft on descent. Of these, two occurred during high-speed descents. Of the other occurrences, three reported the use of CWS-P This included investigation AO-2012-138 below. The crew of a Boeing 737-800 aircraft was conducting a flight from Adelaide, South Australia to Canberra, Australian Capital Territory. Just prior to commencing descent, ATC cleared the aircraft to conduct a high-speed descent. The aircraft descended below the 7,000 ft altitude clearance limit and, after being alerted to this by ATC, the flight crew climbed the aircraft back to 7,000 ft and continued the approach to land. The ATSB found that the combination of auto-flight system mode changes (including inadvertent use of CWS-P) and the management of the airspeed during the descent resulted in a high workload environment. This occurrence highlighted the need to continually monitor descent profiles and airspace limitations in relation to the aircraft’s position. In this case, the FO identified an immediate need to prevent an overspeed, and did so by pulling back on the control column and activating control wheel steering-pitch (CWS-P). This had previously been successful for the FO in addressing an impending overspeed, but the difference in this case was that the force required was larger than experienced by the FO in past situations. The flight data recorded a 41 lb back pressure on the FO’s control column with a resulting 2.14 g loading on reversion to CWS-P. Given the altitude at the time, reversion to CWS-P was considered contrary to Virgin Australia Pty Ltd’s (Virgin) guidance and training in overspeed management. However, the use of the CWS-P mode was reported common among some pilots and, in this case, had possibly become a stored condition-action pattern. Surprise is a cognitive-emotional response to something unexpected. It results from a mismatch between the individual’s mental expectations and what actually happens around them. Experiencing surprise is a combination of physiological, cognitive and behavioural responses (Rivera and others 2014). If a pilot is not expecting things to go wrong, then the level of surprise can result in taking no action, or the wrong action (Martin 2012).In this case, the FO reported feeling a ‘pinch’ when CWS-P activated. This, combined with feeling a high g loading, led the FO to abruptly release the amount of back pressure 1 second after its application. From the evidence available, the following findings are made with respect to the flight path management occurrence involving a Virgin Australia Airlines Pty. Ltd. B737-8FE, registered VH-YID, on descent into Adelaide Airport, South Australia on 9 May 2015. These findings should not be read as apportioning blame or liability to any particular organisation or individual. • Although routinely used for high-speed descents, the selected speed for the descent of 320 kt was close the aircraft’s maximum speed of 340 kt and, in combination with the increased headwind as the aircraft descended through about 8,000 ft, increased the risk of an overspeed. • After identifying the unexpected rapid increase in airspeed, the first officer applied sufficient back pressure on the control column to override the autopilot with the intention of avoiding the impending overspeed. This increased the g loading on the aircraft to an extent where safely walking in the cabin would be difficult. • In response to feeling the increased g loading, the first officer abruptly released the back pressure on the control column, resulting in a sudden pitch change and reduced g loading that led to the cabin crew member losing their footing and sustaining a knee injury. • The Virgin Australia Airlines Pty. Ltd. procedures did not require flight crew to update the QNH, temperature deviation or the descent winds in the flight management computer after departure. 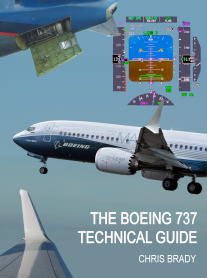 In some circumstances, this would reduce the accuracy of the calculated flight path and increase crew workload in managing the aircraft’s energy state. • At the time of the occurrence, the Virgin Australia Airlines Pty. Ltd. training included a focus on the management of overspeeds. However, the associated simulator training session had not been completed by the crew, increasing the risk that they would not react in accordance with the published operational guidance material. • The earlier-than-usual preparation of the cabin for landing meant that, at the time of the occurrence, the cabin crew were in the final stages of that activity. This reduced the risk of more serious and numerous injuries to the cabin crew and passengers.